There are several alternatives to choose from in Älvdalen. 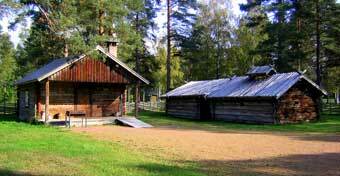 At the Campingground we have cabins and cottages in different sizes. 3. 60 m2, 6 (+2) Beds, Kitchen, TV, Shower, WC. 4. 36 m2, 4 Beds, Pentry, TV, WC. *our bunk-beds are 120 cm wide. Only 100 m to the river! 5. 16 m2 cottages with bunk-beds, refrigerator, hot-plate for cooking and cold running water. Showers and toilets are located in the main service building. At the camping there are also smaller cabins with 2 Beds, places for Caravans and tents, Indoor swimmingpool, Minigolf, Cafeteria and two sheltered fire-pits are available for grilling over an open fire.